This article is about the 2017 series. For the 1972–73 season, see Doctor Who (season 10). The tenth series of the British science fiction television programme Doctor Who premiered on 15 April 2017 and concluded on 1 July 2017, and consisted of twelve episodes, after it was announced in July 2015 that BBC Worldwide had invested in a tenth series of the programme in its annual review. The series is led by head writer and executive producer Steven Moffat, alongside executive producer Brian Minchin. It is the third and final series overseen by the two as executive producers, as well as Moffat's sixth and final series as head writer. This series is the tenth to air following the programme's revival in 2005, and is the thirty-sixth season overall. Preceded by a Christmas special in December 2016, "The Return of Doctor Mysterio", the series is the third and final series starring Peter Capaldi as the Twelfth Doctor, an incarnation of the Doctor, an alien Time Lord who travels through time and space in his TARDIS, which appears to be a British police box on the outside; Capaldi announced in January 2017 that he would be stepping down from the role after the tenth series. The series introduces Pearl Mackie as Bill Potts, the Doctor's newest travelling companion, and also features Matt Lucas as Nardole, who appeared in the 2015 and 2016 Christmas specials. Michelle Gomez and John Simm return as their respective incarnations of the Master. The main story arc for the first half of the series revolved around the Doctor and Nardole occupying themselves as a university professor and assistant while they guard an underground vault containing Missy, who the Doctor has sworn to protect for a thousand years after her supposed execution. Missy later travels with the team in the TARDIS, and eventually partners with her previous incarnation as they all battle a Cyberman onslaught aboard a Mondasian colony ship. Steven Moffat wrote four episodes for the series. Other returning writers who have worked on this series and previous ones include Frank Cottrell-Boyce, Sarah Dollard, Jamie Mathieson, Peter Harness, Toby Whithouse and Mark Gatiss, as well as two new writers for the revived era of the programme, Mike Bartlett and Rona Munro, the latter of whom wrote Survival, the final serial of the original classic era. Directors of the series included three who have previously worked on the show, and three brand new ones. Filming began on 20 June 2016 and lasted just over nine months, ending on 7 April 2017. The series received positive reviews from critics. The performances of Capaldi and Mackie were met with the most praise, as well as the writing, plots and themes of the episodes. The sixth, seventh and eighth episodes of the series, "Extremis", "The Pyramid at the End of the World", and "The Lie of the Land", constitute a three-part arc while remaining separate stories. The episodes "World Enough and Time" and "The Doctor Falls" serve as the series' two-part finale and only multi-part story, in the same format as the eighth series. The Doctor and Nardole investigate the New York branch of "Harmony Shoal", a multinational research company. Also investigating is journalist Lucy Fletcher, and they discover that Harmony Shoal is transplanting alien brains into humans. One of the alien workers finds the three, but they are rescued by the superhero called the Ghost, an alter ego for Grant Gordon, whom the Doctor met several years before when Grant was a child and accidentally turned him into a superhero. Grant is also a nanny working for Lucy, who is unaware of Grant's true identity. The Doctor and Nardole find the aliens' ship, but soon discover that it has been turned into a bomb that will crash into New York as part of a complex plan to implant the alien brains into world leaders, thereby giving them control of the Earth. The Doctor aims the ship towards New York earlier than planned and the collision is stopped by Grant, revealing his identity to Lucy. After he and Lucy announce their love for each other, Grant throws the ship into the sun. UNIT then shuts down Harmony Shoal, but an alien brains implants itself into a UNIT soldier. The Doctor and Nardole have occupied themselves under the guise of a university professor and assistant. Bill Potts is called to the Doctor's office, where she becomes the Doctor's student. Bill is intrigued by a student named Heather. Heather asks her to inspect a puddle, asking her if she can see what's wrong with her reflection. The Doctor investigates the puddle, and notes that it is not a reflection, but something mimicking them. Bill returns to her flat, where she is chased by a moving body of fluid: a living fluid from an alien ship that has absorbed Heather and her feelings for Bill. Bill runs to the Doctor's office and they flee into the TARDIS. The Doctor moves the TARDIS, where he and Nardole check on a vault they are guarding. The TARDIS lands again in Australia, where the Doctor admits who he is. The fluid follows them to another planet in the future, then through a Dalek battle, but survives. Bill convinces "Heather" to let her go, and it departs. The Doctor and Bill return to his office, where he attempts to wipe Bill's memories of the day but she stops him. As Bill leaves, she finds the Doctor waiting with the TARDIS, and joins him. The Doctor and Bill arrive on one of Earth's first colonised planets, Gliese 581d. They are greeted only by two different types of robots: swarm robots (Vardies) and slow but sentient emojibots. An emojibot gives the Doctor and Bill discs that communicate their true emotions. The Doctor theorises that the planet is awaiting the colonists but soon realises that the setup crew has been killed by emojibots and their skeletons crushed to feed the plants. Determined to blow up the city, he finds the main ship within it and its engine room, but Bill runs into a child who has awoken from a pod. The colonists were cryogenically frozen, with a few "shepherds" woken early to work. After one shepherd died, the emojibots could not recognise grief and killed all in mourning in an onslaught against sadness. The awakened colonists decide to fight back, but the Doctor wipes the memory of the robots and reboots everything... only humans must now learn to live with the Vardies, the planet's indigenous species. When the TARDIS returns the Doctor and Bill to London, they discover themselves on a frozen Thames River, with an elephant walking towards them on the ice. The Doctor and Bill find they have arrived in 1814 London, in the midst of a frost fair on the frozen Thames. The Doctor's sonic screwdriver is stolen by Spider, an orphan pickpocket led by Kitty. The Doctor and Bill chase after Spider and Kitty. Glowing lights under the ice encircle Spider's feet and he is pulled through the ice. The Doctor and Bill don diving suits and purposely let the lights take them; they find a giant sea creature ensnared by chains. They learn from Kitty of Lord Sutcliffe; Sutcliffe affirms his family has used the creature to amass a fortune by collecting and selling its waste as a replacement for coal. Sutcliffe sends the Doctor and Bill to be eaten, while he rigs a bomb to cause the ice to shatter. The Doctor and Bill escape, and the Doctor takes the bomb and places it on the creature's chains. When Sutcliffe sets off the bomb, the creature is freed. They return to the present, where Nardole scolds the Doctor for breaking his oath. While checking the Vault beneath the University, Nardole hears something behind it knock repeatedly. Bill and five students sign a lease with a mysterious Landlord to live in his manor house. After helping Bill move in, the Doctor becomes suspicious of the Landlord. A number of the students mysteriously disappear and the groups are separated. The Doctor along with Harry, one of the students, discover a strange cockroach-like creature which the former nicknames "Dryads". Down in the basement they discover leases from decades ago. The Landlord reveals the whole incident was to keep his daughter, Eliza, alive. Bill and another student, Shireen, come across Eliza who is revealed to be composed of wood. After finding Bill, the Doctor realises that the Landlord is actually Eliza's son. The Landlord attempts to send the Dryads after the Doctor and Bill, but Eliza manages to control them. She embraces the Landlord as the Dryads consume them. The students are restored to their physical bodies as the house collapses. Back at the university, the Doctor enters the vault to feed their prisoner as piano music echoes from inside. A long time ago, the Doctor is sent to execute Missy, only to have Nardole interrupt on the behest of River Song. The Doctor refuses to kill Missy, instead opting to imprison and guard her for 1000 years. In the present, the Pope comes to the Doctor, asking to help translate a text called "Veritas". Everyone who has read it has committed suicide, and the Doctor, Nardole, and Bill are brought to the Vatican to investigate. While there, Bill and Nardole discover a portal which leads them to the Pentagon. They find the portals being projected lead to different locations all over the world. The Doctor temporarily restores his sight using Time Lord technology, but is ambushed by aliens. Nardole realises the projectors are not projecting portals, but the whole world. His realization causes him to dematerialise. Bill finds the Doctor, who tells her the world is a simulation, and Veritas contains the proof. Bill then disappears due to the alien's intervention, the Doctor realizing this is a test to see if they can conquer the Earth. However, the simulation is too exact, as his sonic sunglasses still work perfectly, and the virtual Doctor sends his information to the real Doctor warning of the coming invasion. The Doctor is called in by the Secretary-General of the U.N. after a pyramid mysteriously appears on the strategic border of the Russian, Chinese and U.S. armies. It is revealed the Monks are responsible for the pyramid and that they have foreseen a disaster through their simulations, offering an opportunity to save humanity if they consent to their rule. Elsewhere in a biochemical lab, a scientist accidentally misreads the levels of chemicals in an experiment releasing deadly biochemical bacteria. The Secretary-General offers his consent, but is killed when he is viewed to be acting out of fear. The Doctor surmises that the disaster was unrelated to war, but may be biochemical. After the Doctor and Nardole locate the lab, Nardole collapses following exposure to the bacteria whilst waiting in the TARDIS. The Doctor with the assistance of Erica, a lab worker, surmises the only way to stop it would be to destroy the lab. He becomes stuck on the side of a manual lock however, due to his blindness. Bill makes a deal with the Monks to restore the Doctor's sight despite his protests. He manages to escape but at the expense of handing the planet over to the Monks. The Monks now rule the planet, and to most of humanity, they appear to have been on Earth for millions of years, guiding human development. Bill and a few others know the truth. Nardole locates Bill, and they search for the Doctor. They locate him, but he is cooperating with the Monks. Bill shoots him and it appears he is regenerating, but it is all a trick to see whether Bill has been fooled by the Monks. At the university, the Doctor speaks to Missy, who reveals Bill has to die to break the Monk's influence on Earth. The Doctor hopes there is another solution, and infiltrates the Monk's pyramid in London. The Doctor attempts to break the link but fails. Bill prepares to sacrifice herself, however the Monk's images are replaced with those of Bill's mother, which represents hope. Due to their actions, the Monks leave and humanity recall none of the events. Back in the Vault, Missy expresses remorse at those she has murdered. NASA finds the words "God save the Queen" buried under the ice cap of Mars. The Doctor, Bill and Nardole venture to Mars in 1881 and discover soldiers from Victorian Britain. Nardole goes back into the TARDIS, but it returns to the university, and he asks Missy for help getting back. The humans have befriended an Ice Warrior named Friday. Captain Catchlove says they rescued Friday from his crashed spaceship, and Friday allowed the soldiers to use his technology to mine Mars. They unearth the tomb of the Ice Empress Iraxxa; one guard revives her. Friday tells Iraxxa that the Martian surface is uninhabitable. She decides to relent, but a soldier fires his rifle; provoked, she returns fire. Iraxxa starts reviving Ice Warriors. The Doctor threatens to use the mining device to bury them all. Catchlove holds Iraxxa at knifepoint and attempts to force her to help him pilot a spaceship. Godsacre kills Catchlove. Iraxxa calls off the attack in exchange for Godsacre pledging himself to her. The Doctor contacts Alpha Centauri to assist the Ice Warriors, and also leaves the message for NASA. Nardole re-appears with the TARDIS and Missy, who expresses concern about the Doctor. The Doctor and Bill, disagreeing about the fate of the Ninth Legion of the Imperial Roman army, travel in the TARDIS to the 2nd century in Scotland. Bill goes her own way, while the Doctor and Nardole look for their bodies. Bill encounters the Legion's soldiers hiding from a creature drawn to any light source, killing those in its path. Meanwhile, the Doctor and Nardole discover the corpses of the remaining Legion. They later come across a Pict tribe guarding a cairn. The Doctor enters the cairn, passing into an interdimensional portal. The Pict explains that a warrior goes through the cairn to defeat an "Eater of Light", but with the invading Roman army, she allowed one to escape to fight them. Bill leads the surviving legion away from the creature and end up reuniting with the Doctor and Nardole. The Doctor works out a plan to lure the Eater back to the portal during daylight, but it requires someone inside preventing the creature's escape. Once the creature is trapped, The Pict and the Ninth Legion sacrifice themselves to stop the creatures. Back in the TARDIS, Missy awaits their return, to the surprise of Bill and Nardole. The Doctor tells Missy that he has hope she will turn good. In a flash forward, the Doctor stumbles from the TARDIS into a snowy landscape and begins regenerating. Earlier, the Doctor proposed to test Missy by having her answer a distress call. They arrive via TARDIS on a colony ship reversing away from a black hole. They are held at gunpoint by Jorj, who demands to know which of them is human, and Jorj shoots Bill. The Doctor, Missy, and Nardole learn that a few days ago, some of the crew had gone down to the ship's lower decks but never returned. Jorj claims the ship is otherwise empty, but the Doctor shows there are thousands of humans, descendants of the crew: due to time dilation, time moves much faster on the decks furthest from the black hole. Bill awakens in a hospital, having been fitted with a replacement heart. Razor, the hospital caretaker, explains that some of the patients are waiting to be "upgraded" to escape the ship's polluted air. Years later, they see footage of the Doctor coming down the lift, while only a few minutes have passed for the Doctor. The Doctor, Nardole and Missy arrive and discover the origin of the colony ship: Mondas. Razor approaches Missy and reveals himself to be her previous incarnation, formerly known as the Master. The Doctor and Nardole find a Cyberman who reveals itself as Bill. Escaping to a higher floor of the ship, the Doctor tries to comfort Bill, who has retained her humanity, though this is wearing thin. This floor of the ship is a simulated countryside, where the group helps defend the villagers from the oncoming Cybermen. Knowing they are outnumbered, the Doctor attempts to convince Missy and the Master to help him. They refuse, though Missy seems conflicted. Hoping to save the villagers, the Doctor tells Nardole to take them to another floor while he sacrifices himself. Bill opts to stay with the Doctor, and Nardole says goodbye, taking the villagers to safety. Elsewhere, before escaping to their TARDIS, Missy betrays the Master to help the Doctor by stabbing him in the back, triggering the regeneration process. He shoots her in return, killing her and preventing her regeneration. The Doctor fights off the Cybermen, but is severely wounded in the process. He proceeds to blow up the whole floor, killing himself. Bill survives, with Heather appearing before her. They kiss, and Heather reveals she has changed Bill into her species so she could live on. The two take the Doctor's body back to his TARDIS, before she and Heather leave to see the universe together. The Doctor awakens as the regeneration process begins. He attempts to stop it, and exits the TARDIS into a snowy landscape, where he is greeted by the First Doctor. Wandering back to his TARDIS at the South Pole, the First Doctor refuses to regenerate. He encounters the Twelfth Doctor outside his own TARDIS in a similar state of mind. The pair are approached by a displaced, confused and injured First World War British captain. All three are abducted by a spaceship, where inside they meet Bill Potts. They are offered freedom by the ship's glass-like holographic pilot in exchange for allowing the return of the Captain. They escape and take the First Doctor's TARDIS to Villengard. Alone, the Twelfth Doctor meets with the rogue Dalek Rusty. Given access to the Dalek Hivemind, the Doctor learns that the pilot and its ship, known as Testimony is designed to extract people when they died, and archive their memories; Bill is one such avatar. The Doctors agree to return the Captain to his timeline, which happens to be mere minutes before the Christmas truce. The First Doctor informs the Twelfth that he is prepared to regenerate, and returns to his TARDIS. After being alone with Bill's avatar, the Doctor returns to the TARDIS and regenerates after relaying advice to his next incarnation. After the Thirteenth Doctor examines her reflection, the TARDIS suffers multiple failures. Tumbling out of the ship, the console room explodes and the TARDIS dematerialises, as the Doctor plummets towards the Earth. From a hidden corner of a corridor inside a spaceship, the Doctor attempts to answer Bill's questions about their enemies, the Daleks. Bill finds them amusing at first, but the Doctor persists and she realises they are in real danger. Peter Capaldi reprised his role as the Twelfth Doctor in his third and final series; he left after the 2017 Christmas special, while Pearl Mackie portrays the newest companion Bill Potts, after the departure of Jenna Coleman. To avoid leaks while casting the new companion, the production team used the word "Mean Town", an anagram of "Ten Woman"; this is a reference to the fact that Bill is the companion of the tenth series, and was revealed by the casting director Andy Pryor to Radio Times. Mackie made her first appearance in the first episode of the tenth series, and portrays the first openly gay companion. Matt Lucas returned in his role as Nardole, as seen in the 2015 and 2016 Christmas specials "The Husbands of River Song" and "The Return of Doctor Mysterio", in a regular role that started from the first episode of the series, but would not appear in every episode. In June 2016, it was announced that Stephanie Hyam would be joining the tenth series. In July 2016, actors Mina Anwar, Ralf Little, and Kaizer Akhtar had been added to the cast and portrayed Goodthing, Steadfast, and Praiseworthy respectively in the second episode. On 16 August 2016, it was announced that David Suchet, famous for his role in Agatha Christie's Poirot, would appear as a character known as "The Landlord" in the fourth episode, "Knock Knock". Tate Pitchie-Cooper portrayed a child version of The Landlord. Fady Elsayed, who stars in the Doctor Who spin-off Class, was originally set to guest star in an episode of Doctor Who. In October 2016, it was announced that Justin Chatwin was set to appear as a superhero in the 2016 Christmas special "The Return of Doctor Mysterio". He was joined by Charity Wakefield, Adetomiwa Edun, Aleksandar Jovanovic and Logan Hoffman. On 16 November 2016 the BBC announced the cast for the fifth episode, which included Kieran Bew, Peter Caulfield, Mimi Ndiweni and Katie Brayben, with Justin Salinger portraying "Tasker", while Rebecca Benson, Daniel Kerr, Juwon Adedokun, Brian Vernel, Ben Hunter, Aaron Phagura, Sam Adewunmi and Billy Matthews were announced to be appearing in the tenth episode. On 14 October 2016, Michelle Gomez announced that she would reprise her role of Missy in the series, and in May 2017, she further stated that it would be her last series in the role. On 30 January 2017, Capaldi confirmed that the tenth series would be his last. On 6 April 2017, the BBC announced that John Simm would be returning in his role as the Master alongside Gomez. David Bradley made a cameo appearance as the First Doctor at the end of the series finale, "The Doctor Falls", which led into the 2017 Christmas special, "Twice Upon a Time". In July 2015, the annual review for BBC Worldwide indicated that it had invested in a tenth series of the programme. It was announced in January 2016 that Series 10 would be Steven Moffat's final series as showrunner, after which he will be replaced in the role by Chris Chibnall in 2018. In May 2016, Steven Moffat stated in the 500th issue of Doctor Who Magazine that he would be writing the first and last three episodes of the series. Furthermore, he stated that the series would consist mostly of single-part stories so that the new companion, Bill Potts, could have more stories to explore her character, though two-parters would still be present in the series. Moffat also wrote the 2017 Christmas special, after the tenth series has concluded. Lawrence Gough directed the first two episodes of the tenth series, while Frank Cottrell-Boyce wrote the series' second episode, having previously written "In the Forest of the Night" for the eighth series. Sarah Dollard, who wrote "Face the Raven" for the ninth series also returns for an episode, as does playwright Mike Bartlett for an episode in the same production block as Dollard's. Matt Lucas revealed that Jamie Mathieson was set to write the fifth episode for the series, having previously written "Mummy on the Orient Express" and "Flatline" and having co-written "The Girl Who Died". Daniel Nettheim directed two episodes for the series, written by Steven Moffat and Peter Harness, after having previously directed the two-parter "The Zygon Invasion" / "The Zygon Inversion" in the ninth series. In June 2016, Mark Gatiss stated he would be writing an episode for the series; later identified as the ninth episode, a change to Moffat's previous announcement that he would be writing for that particular episode. In 2015, Gatiss had indicated that he might write a sequel for the ninth series episode "Sleep No More"; however, this was not the basis for Gatiss' episode for the tenth series. Instead, the episode featured the return of the Ice Warriors, a race known for their appearances in the eras of the Second Doctor and Third Doctor, and in the 2013 episode "Cold War," also written by Gatiss. Moffat announced in October 2016 that a writer who had previously written for the original classic series would be returning to write an episode, later confirmed as Rona Munro, who previously wrote Survival, the final serial of both Season 26 and the original classic series. Munro is the writer for the tenth episode of the series, titled "The Eaters of Light". Toby Whithouse wrote the eighth episode. On 6 March 2017, it was announced the original Mondasian Cybermen from The Tenth Planet would be returning for the finale of the tenth series. The read-through for the first production block of the tenth series took place on 14 June 2016. Filming began on 20 June 2016. The second episode was filmed in Valencia, Spain. Shooting for the first block concluded on 28 July 2016. The read-through for the second block took place on 18 July 2016, and filming began on 1 August 2016, beginning with the third episode. Production on the 2016 Christmas special began on 5 September 2016 and wrapped on 30 September 2016. The read-through for "Oxygen" took place on 12 October 2016. Shooting on the fourth block began on 17 October and ended on 18 November 2016. Filming for the fifth block began on 23 November 2016, paused in December for a break over the holidays, and resumed on 3 January 2017 and concluding on 17 January 2017. The sixth block began filming concurrently on 16 January 2017, before concluding on 22 February 2017. On 6 March 2017 the BBC stated that the work on the final two episodes of the series had begun, with Rachel Talalay returning to direct her third consecutive series finale. Filming for the series was concluded on 7 April 2017. Production for the 2017 Christmas special started on 12 June 2017, and concluded on 10 July 2017. Filming for the spin-off series Class ran from April to September 2016, beginning before the filming for the tenth series of Doctor Who started. Peter Capaldi took part in the filming of Class, and appeared in the opening episode of the spin-off series. A preview scene was filmed in April 2016 as part of a promotional clip shown on 23 April 2016 on BBC One, during the semi-final half-time of the 2015–16 FA Cup. It introduced the Doctor and his new companion, Bill, being faced with Daleks. However, Moffat has stated that this scene may not be introduced into the series itself. Capaldi, Mackie, Lucas and Moffat promoted the series at New York Comic Con in October 2016. The first trailer for the series was premiered at the end of the 2016 Christmas special, "The Return of Doctor Mysterio". A second teaser trailer was released on 25 February 2017. On 13 March 2017 the BBC released new promotional image of Capaldi, Mackie and Lucas, as well as releasing the title for the premiere. The full trailer for the series was premiered later the same day on BBC One, during the quarter-final half-time of the 2016–17 FA Cup, along with promotional images from the first episode. Leading up to the launch of the series, five teaser trailers aired online. On 31 March 2017 BBC America released the trailer for Doctor Who and the Class. The same day, an interview with Mackie was shown on BBC News, containing clips from the first episode. Another trailer for the series premiered on 3 April 2017. On 9 April 2017 Capaldi, Mackie, Moffat and Minchin attended a panel at the BFI & Radio Times TV Festival, featuring a sneak preview of clips from the upcoming series. Doctor Who's tenth series has received positive reviews. Series 10 holds a 91% approval rating on online review aggregate site Rotten Tomatoes with an average score of 7.54/10. The website's critical consensus reads, "Peter Capaldi's darkest wit shines in his final season as Doctor Who thanks to the newest foil and friend, Bill Potts." Writing for the Radio Times halfway through the series' run, Huw Fullerton calls it "a return to form for the sci-fi series after a much-needed rest year, with the format, actors and writers all feeling fresher than during their last outing". Reaction to individual episodes have also been positive, with scores on the site ranging from 83% to 100%; four episodes of the series hold a perfect approval rating, which include the final three of the series. Specifically, episodes such as "Oxygen" and "Extremis" received positive reception, with critics saying that the former was a "great, thought-provoking episode", whilst the latter was labelled as a unique and ambitious episode, and that "Doctor Who doesn't get better than this". The series also introduced Pearl Mackie as Bill Potts, the Doctor's newest companion; Mackie has received consistently favorable comments, noting how she was "bringing an energy distinct from any previous new series companion", describing Bill as "a wonderful change of pace", and how her acting was "consistently honest, raw at times, and never, ever whimsy", with certain scenes being "guttural" and "heart-wrenching". Controversial topics, such as racism and capitalism, were covered during episodes in the series, and were also met with positive reactions. "Extremis" 2 × 50 min. "World Enough and Time" / "The Doctor Falls" 1 × 60 min. Doctor Who: The Complete Tenth Series 2 × 60 min. 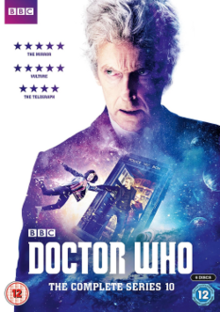 8, 9, 10 Doctor Who: The Complete Peter Capaldi Years 26 × 45 min. Includes "The Return of Doctor Mysterio"
Binaural sound edition of "Knock Knock"
Behind the scenes on "The Doctor Falls"
Audio Commentaries on "The Pilot", "Knock Knock" and "Oxygen"
^ a b "Truth or Dare". Doctor Who Magazine. No. 512. 4 May 2017. p. 27. ^ "Doctor Who Guide: Series Ten [Season 36] (2017)". Doctor Who News. Story numbers can be viewed by clicking the respective episode. Retrieved 17 April 2017. ^ a b c d e f g h i j k l m n o p "Ratings Guide". Doctor Who News. Retrieved 18 October 2018. ^ a b "Peter Capaldi announces he will stand down as Doctor Who at the end of the year". BBC. 30 January 2017. Retrieved 1 February 2017. ^ "Doctor Who: Pearl Mackie named as new companion". BBC News. 23 April 2016. Retrieved 24 April 2016. ^ "Pearl Mackie's Doctor Who codename revealed". ^ K McEwan, Cameron (26 May 2016). "Steven Moffat reveals Pearl Mackie to debut in 2017, her name and when's she's from..." Doctor Who. Retrieved 26 May 2016. ^ a b Lu, Anne (18 August 2016). "'Doctor Who' season 10: Bill's intro scene may cause continuity errors, may not be canon". IBTimes. Retrieved 24 August 2016. ^ "'Poldark' director joins 'Doctor Who' Christmas special". CultBox. 22 September 2016. Retrieved 22 September 2016. ^ a b Mzimba, Lizo (31 March 2017). "Doctor Who gets first openly gay companion". BBC News. Retrieved 31 March 2017. ^ "Series 10: Nardole is a Full-Time "Non-Human" Companion". ^ K McEwan, Cameron (14 June 2016). "Look Who's Back! Matt Lucas returns for Doctor Who Series 10". Doctor Who. Retrieved 23 June 2016. ^ K McEwan, Cameron (18 June 2016). "Writers new and old confirmed for Doctor Who Series 10". Doctor Who. Retrieved 23 June 2016. ^ a b K McEwan, Cameron (16 August 2016). "Acting legend David Suchet joins guest cast of Doctor Who Series 10". Doctor Who. Retrieved 16 August 2016. ^ "Doctor Who Season 10 Release Date, Trailer, Cast, & Everything Else We Know". Den of Geek. 18 January 2017. ^ a b c d "Matt Lucas to join Peter Capaldi and Pearl Mackie for Doctor Who series 10". BBC. 14 June 2016. Retrieved 14 June 2016. ^ "Doctor Who Series 10: Three New Cast Members Confirmed". Den of Geek. 7 July 2016. Retrieved 8 July 2016. ^ "Mina Anwar in Valencia Filming". Twitter. 28 July 2016. Retrieved 29 July 2016. ^ info@blue-compass.com. "Tate Pitchie-Cooper, Actor". ^ "Fady Elsayed – Beaumont Communications". ^ "2016 Christmas Special: The Return of Doctor Mysterio | Doctor Who TV". www.doctorwhotv.co.uk. Retrieved 7 October 2016. ^ O'Connor, Roisin (1 October 2016). "Doctor Who Christmas Special: 'Superhero' character reported to be joining Peter Capaldi for festive episode". Independent. ^ "Doctor Who Superhero Adventure for Christmas Day". BBC. 7 October 2016. Retrieved 7 April 2017. ^ "Gordon and French – Justin Salinger Profile". www.gordonandfrench.co.uk. Retrieved 17 November 2016. ^ "The 2017 Series… Returning Writers, Cast Updates and More!". BBC. 16 November 2016. Retrieved 7 April 2017. ^ "Michelle Gomez Confirms Return To 'Doctor Who' For Series 10". The Music. 14 October 2016. Retrieved 14 October 2016. ^ "Michelle Gomez confirms she's leaving Doctor Who with Peter Capaldi: "It's the end of an era"". DigitalSpy. 16 May 2017. Retrieved 16 May 2017. ^ "First look pictures of the First and Twelfth Doctors together in the Doctor Who Christmas special". The Telegraph. 1 July 2017. Retrieved 1 July 2017. ^ "Doctor Who Series 10 Confirmed". Doctor Who News. 14 July 2015. Retrieved 15 July 2015. ^ Dowell, Ben (22 January 2016). "Doctor Who showrunner Steven Moffat quits to be replaced by Broadchurch creator Chris Chibnall". Radio Times. Retrieved 22 January 2016. ^ "Everything we know so far about 'Doctor Who' Season 10". CultBox. 20 August 2016. Retrieved 2 January 2017. ^ "Series 10 Filming July, Will Be Mostly One-Parters". Doctor Who TV. 28 May 2016. Archived from the original on 28 May 2016. Retrieved 28 May 2016. ^ Rawden, Jessica (3 June 2016). "When Steven Moffat's Final Doctor Who Episode Will Air". Cinema Blend. Retrieved 5 June 2016. ^ "Doctor Who series 10: Jamie Mathieson set to return". ^ "'Zygon Invasion' director is returning to 'Doctor Who'". CultBox. 24 November 2016. Retrieved 28 November 2016. ^ a b BBC (27 January 2017). Series 10 Trailer, The Pirate Planet and More! – Doctor Who: The Fan Show. YouTube. Event occurs at 1:10 (Block 5's writers), 1:51 (Block 6's writers). Retrieved 27 January 2017. ^ Martin, William (6 June 2016). "First writer confirmed for 'Doctor Who' Season 10". CultBox. Retrieved 6 June 2016. ^ Holmes, Jonathan (14 November 2015). "Mark Gatiss has a sequel planned to Doctor Who's Sleep No More". Radio Times. Retrieved 12 June 2016. ^ Jeffery, Morgan (8 December 2016). "It looks like Doctor Who series 10 won't be giving us a 'Sleep No More' sequel after all". Digital Spy. Retrieved 30 January 2017. ^ Jeffery, Morgan (31 January 2017). "Doctor Who series 10 will bring back classic villains The Ice Warriors". Digital Spy. Retrieved 1 February 2017. ^ "Moffat Promises Classic Doctor Who Writer For New Season". Comic Book Resources. 9 October 2016. Retrieved 9 October 2016. ^ "Series 10: Classic Writer Returns With "The Eaters of Light"". DoctorWhoTV. 16 November 2016. Retrieved 16 November 2016. ^ Tom Spilsbury [@TomSpilsbury] (4 February 2017). "Oh yes, I didn't see your earlier tweet. That's correct, yes. They switched after they'd already made Rona's episode" (Tweet). Retrieved 4 February 2017 – via Twitter. ^ "Toby Whithouse Writing for Series 10". Doctor Who TV. 14 December 2016. Retrieved 15 December 2016. ^ The Doctor Who Team (6 March 2017). "Original Mondasian Cybermen return to Doctor Who!". BBC Latest News – Doctor Who. Retrieved 8 May 2017. ^ Lazarus, Susanna (14 June 2016). "Pearl Mackie joins Peter Capaldi for the first Doctor Who read-through of series 10". Radio Times. Retrieved 20 July 2016. ^ Jones, Paul (4 June 2016). "Doctor Who series 10 starts filming in two weeks". Radio Times. Retrieved 4 June 2016. ^ Eams, Tom (25 July 2016). "New Doctor Who companion Bill takes a Spanish selfie with The Doctor as they shoot series 10". Digital Spy. Retrieved 25 July 2016. ^ "The latest on Doctor Who series 10". BBC. 29 July 2016. Retrieved 29 July 2016. ^ Fullerton, Huw (19 July 2016). "Pearl Mackie is getting us all excited about the next series of Doctor Who". Radio Times. Retrieved 20 July 2016. ^ "Series 10: Block 2 Filming Begins". Doctor Who TV. 1 August 2016. Retrieved 1 August 2016. ^ Fullerton, Huw (6 September 2016). ""A lot of heart, but a lot of brain too" – could the Doctor Who Christmas special feature a return for a fan favourite?". Radio Times. Retrieved 6 September 2016. ^ "UPDATED: 2016 Christmas Special Adds A Superhero – Doctor Who TV". ^ "Oxygen, Series 10, Doctor Who – Oxygen: The Fact File – BBC One". BBC. ^ "Daniel Nettheim on Twitter". ^ "Doctor Who series 10: filming resumes, new set snap". Den of Geek. 6 January 2017. Retrieved 6 January 2017. ^ "Extremis: The Fact File". BBC. 20 May 2017. Retrieved 4 June 2017. ^ "The Lie of the Land, Series 10, Doctor Who – The Lie of the Land: The Fact File – BBC One". BBC. ^ "Original Mondasian Cybermen return to Doctor Who!". BBC. 6 March 2017. Retrieved 6 March 2017. ^ "It's a wrap! The Series 10 shoot comes to an end, and here's one of today's boards, illustrated by Peter Capaldi!". Twitter. 7 April 2017. Retrieved 7 April 2017. ^ "Countdown to the Thirteenth Doctor". Doctor Who Magazine. No. 514. 29 June 2017. p. 4. ^ Cannon, Nick (11 April 2017). "Doctor Who's Peter Capaldi lifts off with new companion Bill: 'Their adventures spin out of control'". What's on TV. Retrieved 11 April 2017. ^ Allen, Ben (11 July 2017). "Peter Capaldi says goodbye to fans on his final day of Doctor Who filming". Radio Times. Retrieved 11 July 2017. ^ The Doctor Who Team (4 April 2016). "BBC Three announce cast for Doctor Who spin off – Class". Doctor Who. Retrieved 15 May 2016. ^ "Patrick Ness on Twitter". ^ "Confirmed: Peter Capaldi will be appearing in 'Class'!". CultBox. 6 September 2016. Retrieved 6 September 2016. ^ "Every Series 10 Episode Title, Writer & Director So Far". Doctor Who TV. Retrieved 5 April 2017. ^ "Back on TV!". Doctor Who Magazine. No. 511. 6 April 2017. pp. 48, 49. ^ Earnshaw, Jessica (23 April 2016). "BBC tease first glimpse of new Doctor Who companion in action ahead of big reveal". Daily Express. Retrieved 23 April 2016. ^ "NYCC 2016: Peter Capaldi introduces Doctor Who's New Companion Bill". IGN.com. 7 October 2016. Retrieved 9 October 2016. ^ "Doctor Who companion Bill sees the universe anew in the series 10 trailer". Radio Times. 25 December 2016. Retrieved 25 December 2016. ^ Fullerton, Huw (25 February 2017). "New Doctor Who trailer shows off more of Peter Capaldi's final series". Radio Times. Retrieved 25 February 2017. ^ "New Series News!". BBC. 13 March 2017. Retrieved 13 March 2017. ^ "Missy returns and classic monsters rule in new Doctor Who series 10 trailer". Radio Times. 13 March 2017. Retrieved 13 March 2017. ^ K McEwan, Cameron (17 March 2017). "Doctor Who Series 10 first ep title revealed". Doctor Who. Retrieved 7 April 2017. ^ Fullerton, Huw (30 March 2017). "New Doctor Who teaser shows off a brilliant Tardis trick". Radio Times. Retrieved 7 April 2017. ^ "The new series of #DoctorWho begins on @BBCOne on Saturday, 15th April!". Instagram. 31 March 2017. Retrieved 7 April 2017. ^ Fullerton, Huw (3 April 2017). "The Doctor traps a Dalek in new Doctor Who series 10 clip". Radio Times. Retrieved 7 April 2017. ^ Fullerton, Huw (5 April 2017). "This new Doctor Who series 10 teaser is full of heart(s)". Radio Times. Retrieved 7 April 2017. ^ Fullerton, Huw (7 April 2017). "New Doctor Who series 10 teaser sees the Doctor on a mission". Radio Times. Retrieved 7 April 2017. ^ Hewitt, Susan (2 April 2017). "New BBC America Promotional Trailer for Doctor Who and the Class". Blogtor Who. Retrieved 7 April 2017. ^ Fullerton, Huw (3 April 2017). "New Doctor Who series 10 trailer sees the Doctor start to regenerate". Radio Times. Retrieved 7 April 2017. ^ K McEwan, Cameron (27 March 2017). "Peter Capaldi and Pearl Mackie to attend BFI & Radio Times TV Festival". Doctor Who. Retrieved 11 April 2017. ^ a b c d e f g h i j k l m n "Weekly top 30 programmes". Broadcasters' Audience Research Board. ^ "The Return of Doctor Mysterio - Overnight Viewing Figures". Doctor Who News. 26 December 2016. Retrieved 24 October 2018. ^ "The Pilot - Overnight Viewing Figures". Doctor Who News. 16 April 2017. Retrieved 24 October 2018. ^ "Smile - Overnight Viewing Figures". Doctor Who News. 23 April 2017. Retrieved 24 October 2018. ^ "Thin Ice - Overnight Viewing Figures". Doctor Who News. 30 April 2017. Retrieved 24 October 2018. ^ "Knock Knock - Overnight Viewing Figures". Doctor Who News. 7 May 2017. Retrieved 24 October 2018. ^ "Oxygen - Overnight Viewing Figures". Doctor Who News. 14 May 2017. Retrieved 24 October 2018. ^ "Extremis - Overnight Viewing Figures". Doctor Who News. 21 May 2017. Retrieved 24 October 2018. ^ "The Pyramid At End Of World - Overnight Viewing Figures". Doctor Who News. 28 May 2017. Retrieved 24 October 2018. ^ "The Lie Of Land - Overnight Viewing Figures". Doctor Who News. 4 June 2017. Retrieved 24 October 2018. ^ "Empress Of Mars - Overnight Viewing Figures". Doctor Who News. 11 June 2017. Retrieved 24 October 2018. ^ "The Eaters Of Light - Overnight Viewing Figures". Doctor Who News. 18 June 2017. Retrieved 24 October 2018. ^ "World Enough And Time - Overnight Viewing Figures". Doctor Who News. 25 June 2017. Retrieved 24 October 2018. ^ "The Doctor Falls - Overnight Viewing Figures". Doctor Who News. 2 July 2017. Retrieved 24 October 2018. ^ "Twice Upon a Time - Overnight Viewing Figures". Doctor Who News. 26 December 2017. Retrieved 24 October 2018. ^ a b "Doctor Who: Season 10". RottenTomatoes. Retrieved 28 February 2019. ^ Fullerton, Huw (24 May 2017). "Doctor Who season 10: halfway through the new series, how is it doing?". Radio Times. Retrieved 11 June 2017. ^ Ruediger, Ross. "Doctor Who Recap: Zombies in Space". New York Magazine. Retrieved 14 May 2017. ^ Zoe Delahunty-Light (20 May 2017). "DOCTOR WHO S10.06 REVIEW: "DOCTOR WHO DOESN'T GET BETTER THAN THIS"". GamesRadar. Retrieved 20 May 2017. ^ "Doctor Who returns at long last, and it's got us a brand new companion". The A.V. Club. 15 April 2017. ^ Ruediger, Ross. "Doctor Who Season Premiere Recap: The Women with the Stars in Their Eyes". New York Magazine. Ross Ruediger. Retrieved 16 April 2017. ^ Zoe Delahunty-Light (13 May 2017). "DOCTOR WHO S10.05 REVIEW: "WE GET TO SEE THE DOCTOR AT HIS MOST VULNERABLE"". GamesRadar. Retrieved 14 May 2017. ^ Nguyen, Hanh. "'Doctor Who' Review: Racism and Privilege Are No Match for the Doctor in Chilling Episode". IndieWire. Hanh Nguyen. Retrieved 30 April 2017. ^ Serrao, Nivea. "Doctor Who recap: 'Thin Ice'". Entertainment Weekly. Nivea Serrao. Retrieved 30 April 2017. ^ Collura, Scott (13 May 2017). "Doctor Who: "Oxygen" Review". IGN. Retrieved 14 May 2017. ^ "Doctor Who: Series 10". Rotten Tomatoes. Retrieved 23 September 2018. ^ "Doctor Who - The Return of Doctor Mysterio [DVD] ". Amazon. Retrieved 3 December 2016. ^ "Doctor Who: The Return of Doctor Mysterio". JB Hi-Fi. Retrieved 19 January 2017. ^ Lambert, David (8 December 2016). "Doctor Who - The BBC Announces Blu-rays, DVDs for the 2016 Christmas Special". TVShowsOnDVD. Archived from the original on 11 December 2016. Retrieved 9 December 2016. ^ "Doctor Who - Series 10 Part 1 [DVD] ". Amazon. Retrieved 24 March 2017. ^ "Doctor Who - Series 10 Part 1". JBHiFi. Retrieved 15 May 2017. ^ Lambert, David (21 February 2017). "Doctor Who - 2017 Episodes in 'The 10th Series, Part 1' and 'The 10th Series, Part 2'!". TVShowsOnDVD. Archived from the original on 22 February 2017. Retrieved 22 February 2017. ^ "Doctor Who - Series 10 Part 2 [DVD] ". Amazon. Retrieved 24 March 2017. ^ "Doctor Who - Series 10 Part 2". ABC Shop. Archived from the original on 9 July 2017. Retrieved 8 June 2017. ^ Lambert, David (14 July 2017). "Doctor Who - New Release Date Provided by the BBC for 'The 10th Series, Part 2'". TVShowsOnDVD. Archived from the original on 16 July 2017. Retrieved 15 July 2017. ^ Marcus (12 October 2017). "Doctor Who Series 10 Complete DVD, Bluray and Steelbook". Doctor Who News. Retrieved 12 October 2017. ^ "Doctor Who: Series 10 (DVD)". EzyDVD. Retrieved 13 October 2017. ^ Lambert, David (31 August 2017). "Doctor Who - Official BBC Press Release: 'The Complete 10th Series' on DVD, Blu-ray". TVShowsOnDVD. Archived from the original on 1 September 2017. Retrieved 1 September 2017. ^ "Doctor Who Christmas Special 2017 - Twice Upon A Time". Amazon. Retrieved 15 December 2017. ^ "Doctor Who Christmas Special 2017 - Twice Upon A Time [4K UHD] ". Amazon. Retrieved 2 September 2018. ^ "Doctor Who: Twice Upon a Time (DVD)". EzyDVD. Retrieved 17 December 2017. ^ "Doctor Who - Twice Upon A Time (2017 Christmas Special)". JBHiFi. Retrieved 15 September 2018. ^ "Doctor Who Christmas special set for February DVD and Blu-ray release". Amazon. Retrieved 24 December 2017. ^ "Doctor Who: Twice Upon a Time UHD". Amazon. Retrieved 2 September 2018. ^ "Doctor Who: The Complete Peter Capaldi Years". Amazon.com. Retrieved 1 December 2017. ^ "Doctor Who: The Peter Capaldi Collection". Amazon.com. Retrieved 16 December 2018. ^ Lambert, David (31 August 2017). "Doctor Who – Official BBC Press Release: 'The Complete 10th Series' on DVD, Blu-ray". TVShowsOnDVD. Archived from the original on 1 September 2017. Retrieved 1 September 2017. ^ "Doctor Who: Series 10 (DVD)". EzeDVD. Retrieved 13 October 2017.